Hardie Gramatky biography provided courtesy of “California Watercolors 1850-1970” By Gordon T. McClelland and Jay T. Last. Hardie Gramatky was raised in Southern California. He studied art with E Tolles Chamberlin, Clarence Hinkle, Pruett Carter and Barse Miller. A dedicated student of watercolor painting, Gramatky produced an average of five small watercolors per day. 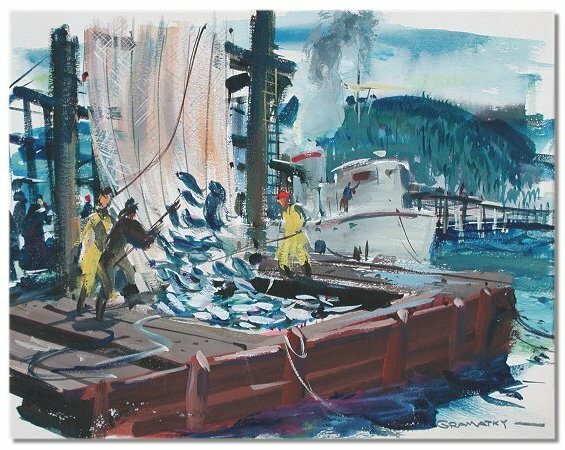 By 1929, he had become a proficient watercolorist and was recognized as one of the true innovators in the development of California Style watercolor painting. These skills helped him to get a job as a senior animator at the Walt Disney Studios. extended biography is available in McClellands "California Watercolors" book. Interview with Dorothy Gramatky, 1983.